Last week Tuesday around 9 p.m. I got a WeatherBug frost warning for Madison. Had I known earlier I could have gathered whatever blankets and sheets we didn't mind putting over the tomatoes, peppers and eggplants, but we weren't prepared, it was late and the garden doesn't have lights in it. I went to sleep resigned with the end of the season yet hoping it was a false alarm. 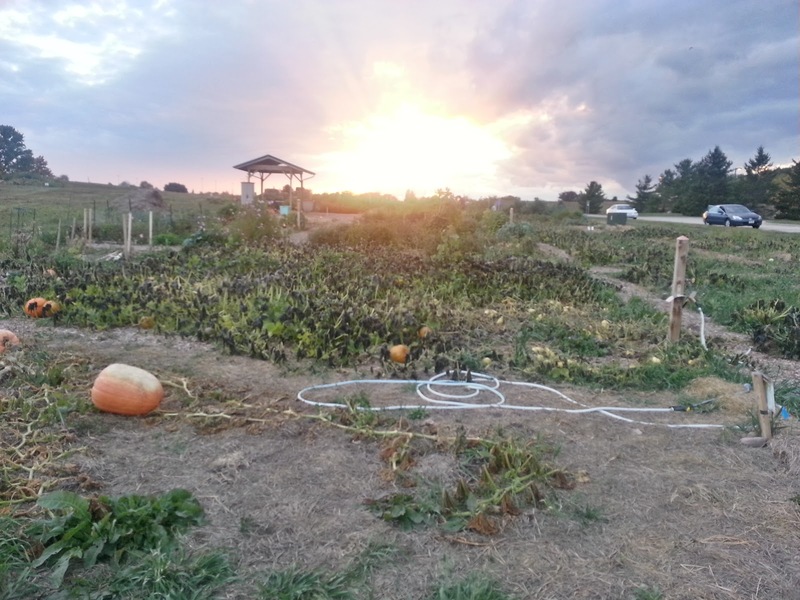 At 6:30 the next morning I went to the garden. Most of my plants seemed fine. The beans definitely got touched by frost, but my tomatoes and peppers and eggplant were untouched. 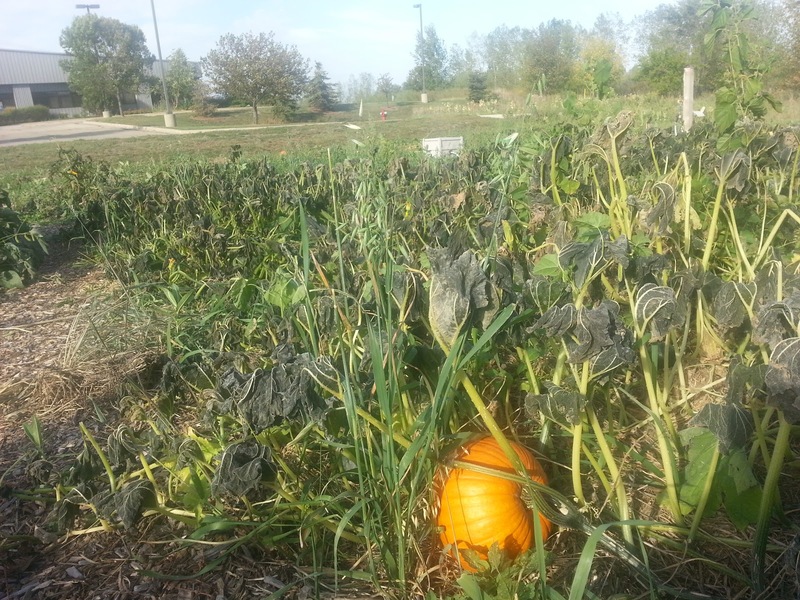 Our community pumpkin patch was, however, a different story. Leaves were slumped to the ground, revealing their unripened fruit. It was a disaster. 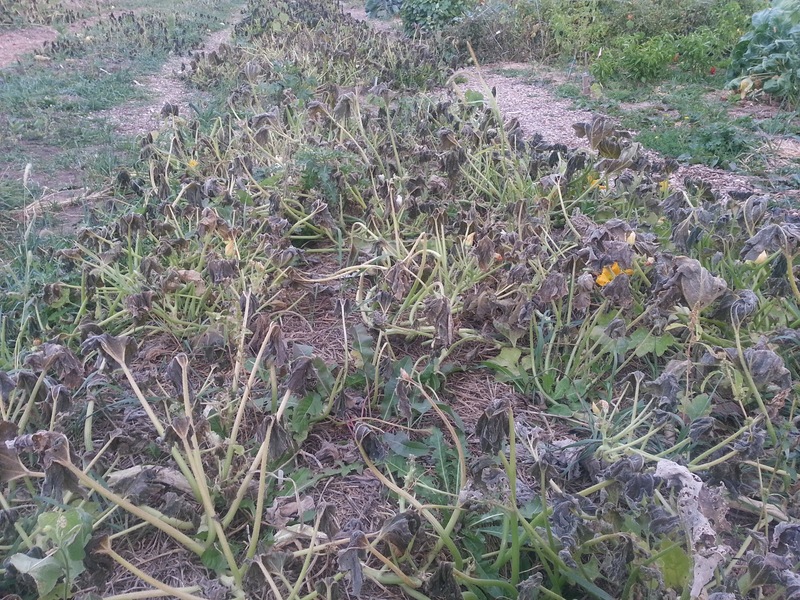 Green pumpkins, unripe winter squash and lots of summer squash were all exposed, and attached to lifeless vines. I called Jay, depressed, upset and nearly in tears. 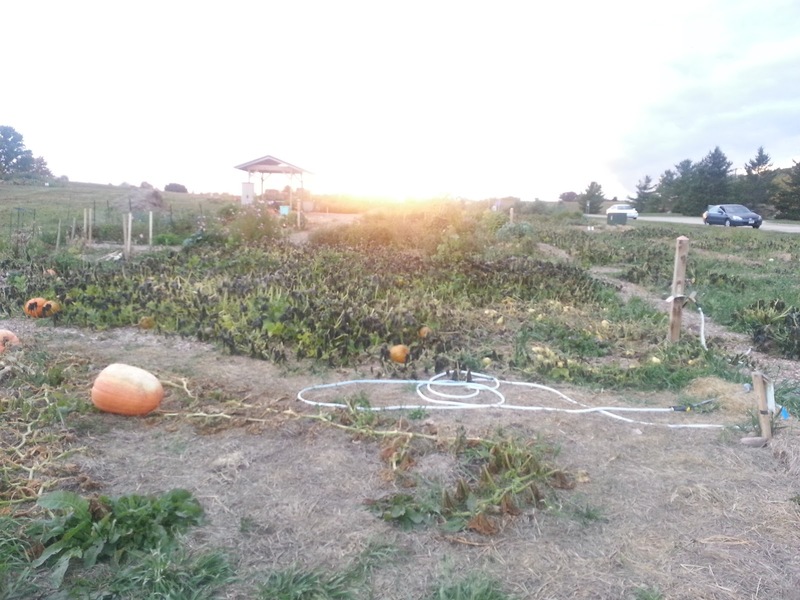 Our community pumpkin patch members had worked so hard, it was heart-wrenching to see all that work go to waste, cut short but a relatively early frost. Our earliest frost potential IS Sept. 25, but we don't typically frost until early October, which would have given these plants a few more weeks to ripen the fruit on the vine. Scene of destruction following the early frost. That Friday I heard a freeze warning for Madison the following night. Jay and I were on our way out of town for a weekend at my parents' house - and I went into a bit of a panic. Again we weren't prepared with sheets or blankets, but it didn't matter, we weren't going be available to remove the blankets during the day for two days. I made the call to harvest everything - EVERYTHING. 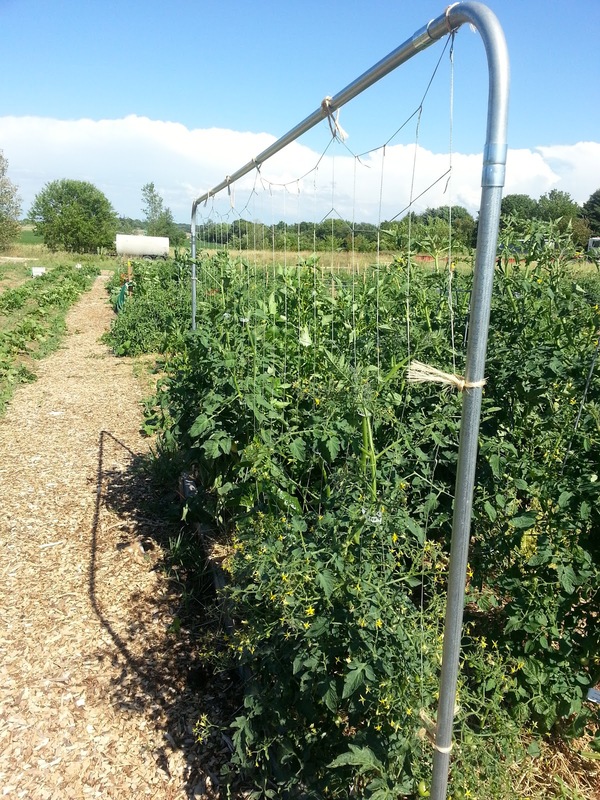 We worked for a few hours pulling all our tomatoes - red, green and inbetween. We took all the tomatillos, ground cherries, and eggplant no matter the size. 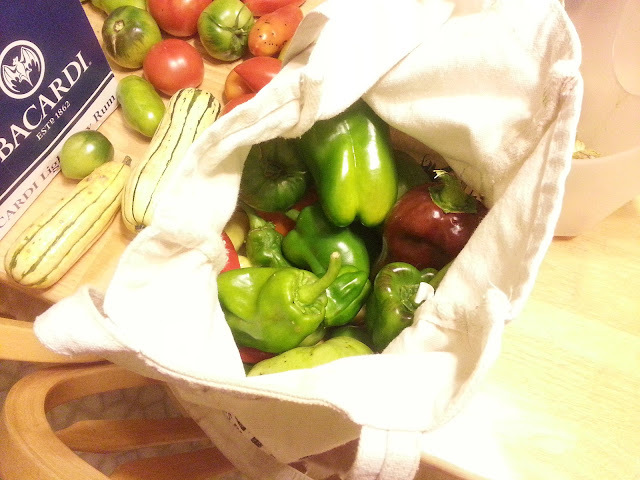 Finally, we picked all the peppers whether they had turned color or not. 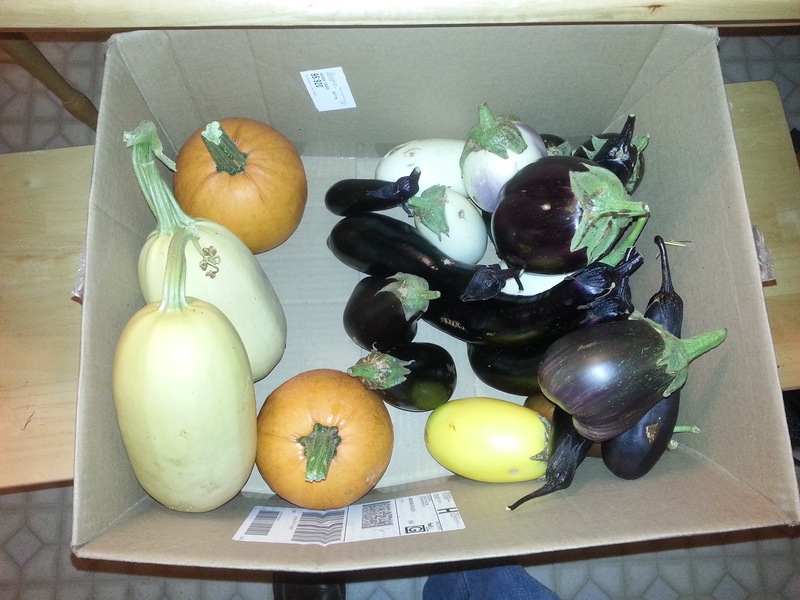 We filled four boxes and several grocery bags with produce, put them in the trunk. 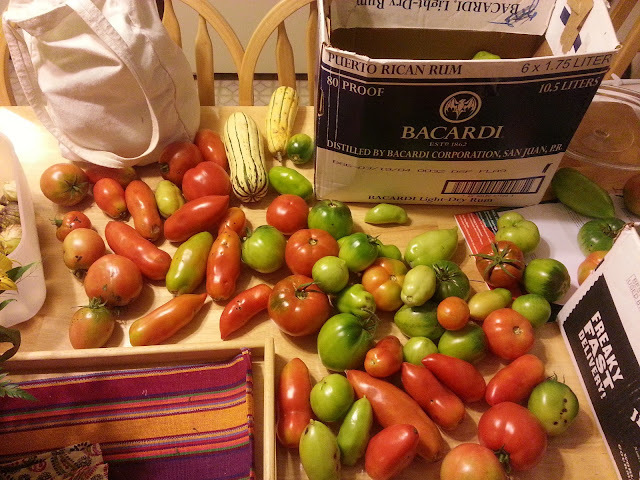 A gardener friend of mine was picking produce and covering her plants. We walked over to Peg and took this silly self-portrait with my phone camera. The golden sun on our faces and pale blue gray sky was a fitting backdrop to this autumn ritual. And the false frost? It turns out that it didn't freeze on Saturday night, but it did Sunday night, and to be honest, I'm not sure I had it in me to cover and uncover. 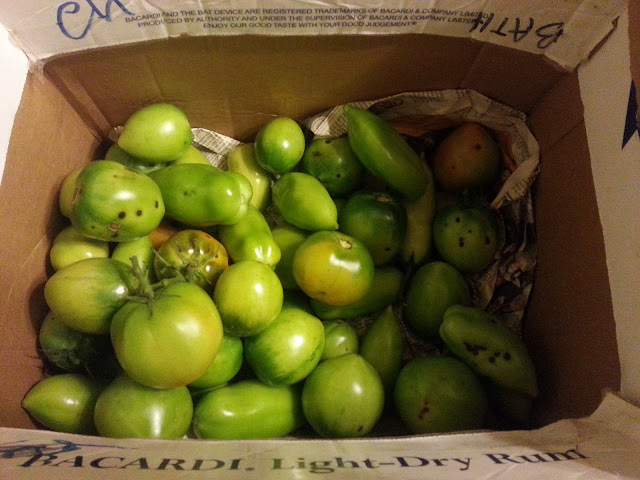 Please write in the comments below your favorite ways to preserve green tomatoes - we've got a lot of them! 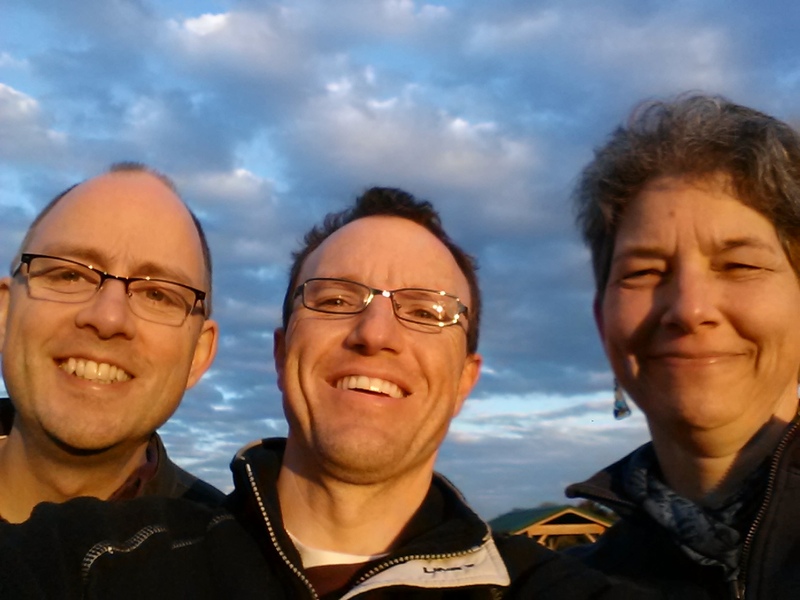 Jay, me and Peg in the garden before the next frost. Spaghetti squash, pie pumpkins and three varieties of eggplant. 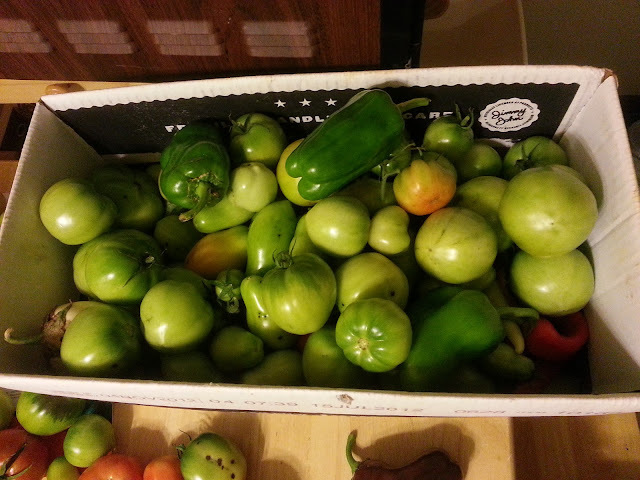 30# of green tomatoes and bell peppers. A large box of jalapeno, cayenne and ancho peppers. 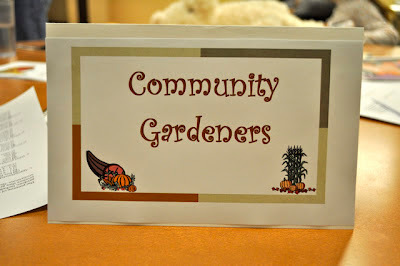 Monday, Oct. 29, 6 - 8 p.m.
Last year, Jay and I attended the annual Community and Food Pantry Gardens Fall Harvest Potluck. We had a great dinner (imagine all that garden produce coming to roost at a pot luck!) 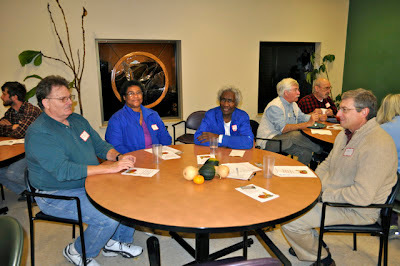 and enjoyed getting to know community gardeners from across Madison. I'm going again this year, and I'd love to meet you there! This year, I'm hoping to entice some corporate community gardeners to join me at a table to talk about the unique aspects of this type of community garden. try yummy food - heck, you could even swap recipes! 1862 Beld St, Madison. CMC is just east of Park Street near Bram Street. 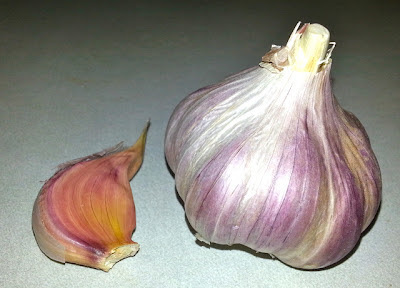 I recently took a class about successfully raising garlic. You may wonder "Why?" especially after my early boasting about garlic. I'm of the school that's there's always something new to learn, and in this case, the class confirmed everything I knew about garlic (not a bad thing to do), and I learned a couple of new things. The class was presented by Gary Kuzynski, A.G.G. (amateur garlic grower :). This garlic class is actually one part of a series of five classes that Gary presents every springtime. He presents this part again in the autumn because it's nearly time to plant garlic. He said that at the end of the class, we were all A.G.G., that's cool, I got a title after a 90-minute class! I asked if I could write about some highlights in my blog, and he told me to freely share information on my blog. I'll let you know when I learn when Gary's springtime series will take place. My Duganski hard-neck garlic, planted in Oct. '11 and harvested July '12. One of the highlights of the class and something I certainly didn't know about is that if you care, you can plant garlic (an all other plants) according to the phases of the moon. Plants that grow up above the ground prefer to be planted during the first and second quarters, that's between the new moon and the full moon. On the other hand, plants that grow below the ground prefer to be planted during the third and fourth quarters, between the full moon and the next new moon. It gets even more detailed, for example, garlic is best planted during the third quarter shortly after the full moon. In 2012, the ideal time to plant garlic, according to this moon planting philosophy, is either early October, or early November. However, Gary cautioned us that it's possible to plant garlic too early. Last year, I planted my garlic sometime in October, and I know that it started to sprout shortly after I planted it. This is not disastrous, but does take a withdrawal from the seed clove in the autumn, which will result in stunted garlic the next year. If my garlic was stunted this year, I can't wait to see my garlic next year! According to the moon table that Gary provided us, the very best time to plant garlic is on Saturday, November 3. Sunday the 4th is okay to, but starting the 5th, other elements that I won't get into right now could result in a less ideal planting time. During the class, I looked at my calendar, and found that I am free on Saturday November 3, so that’ s when I’m planting garlic. If you have not ordered garlic from a mail-order seed supplier, it's most likely too late to order from them, but don't worry. You can still acquire garlic to plant this fall from your local farmers market or greenhouse. It's important to note that most garlic sold in grocery stores has been treated not to sprout. 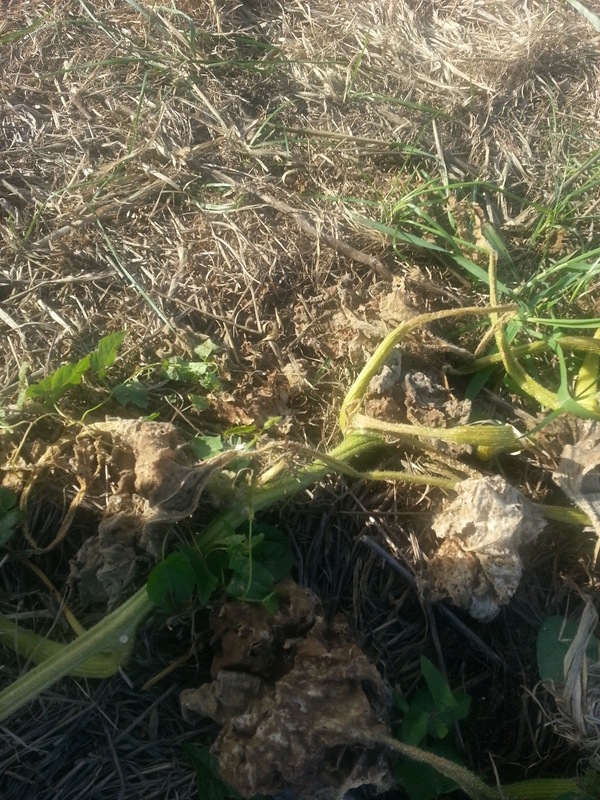 You may get a few successful plants, but you'd be much better off buying organic untreated garlic. If you've got little time, ask the farmer what variety you are buying and you can look it up later online. I'll write post about planting techniques closer to planting time. Well, this series got a bit side-lined by an out-of-town vacation and garden work. I should write something like this in the winter when we're all looking for some reading about summer. I used this 10-foot long trellis to support a climbing variety of tomatoes that I don't recommend. (Olds Trip-L Climber. It splits at the shoulders and this year for me, it didn't yeild much). The trellis, however, did the job and I have an idea of what to do next year. In a previous blog post, I lay out how to build this type of trellis, down to the parts and cost for each one at Home Depot. In my small garden, positioning the trellis is important, and here are the changes I'm making next year. You can order these from Territorial Seed Company. I have 4-foot wide beds. 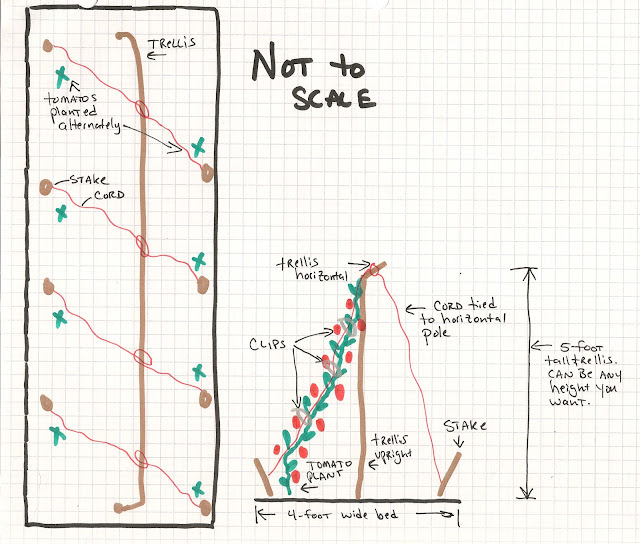 I'm going to position the 10-foot long by 5-foot tall trellis down the middle of one bed. 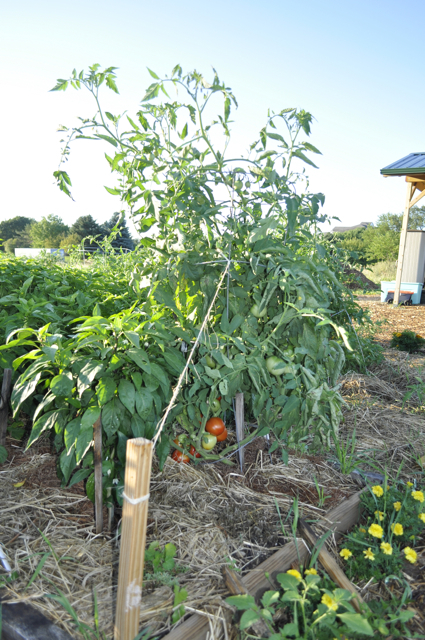 Then, I'll alternately plant indeterminate tomatoes a foot from either long-edge of the bed. Instead of the netting, I'm going to tie a cord to the top of the trellis and drape the cord down either side of the trellis. As the plants grow, I'll prune viciously and use tomato clips to direct the remaining vines up the cord. Just in case you're wondering, I do not get anything for mentioning products or stores. I just tell you what I like. 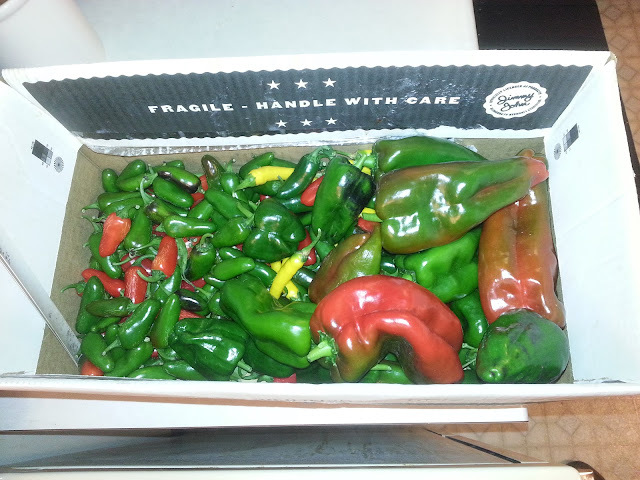 I used my parent's dehydrator last autumn to preserve part of my hot pepper abundance and at once saw the value and practicality of dehydrating food. The benefits are compounded by the limits of our smallish freezer and inability (for now) of buying a chest freezer. 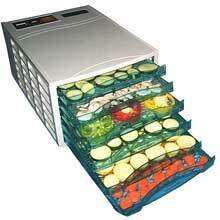 A few weeks ago I took a great dehydrating class (through the Willy Street Coop by Polly Reott, master food preserver) where I pretty much decided to buy a dehydrator. Now the decision is which one to buy. Please post your opinions and comments to my three questions below. If you are reading this by email, please go to the blog to post your answers so all can see! Thanks. The obvious benefit to the vertical air-flow models is that there are stacking trays, which in some cases can be stacked pretty darn tall. This means that the dehydrator is always the right size for the job. 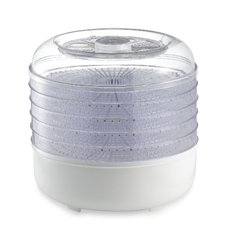 My research (so far) is that vertical (round) dehydrators are cheaper to initially purchase. However, the trays on the far side of the heating element receive cooler air, and often stacks need to be changed around. The vertical airflow also means that for the most part, you can't mix vegetables in the unit, because peppers below could flavor the tomatoes above. Also, most vertical units are round. Geometrically speaking, most round and square units will take up about the same counter space but a square unit would provide more tray space. I went online to do some research. Polly highly recommended the "horizontal airflow" models such as the Excalibur they had at Willy West. You can deduce two of the pro's by reading the cons above; less chance of flavor mixing with the horizontal air flow and more even heating. However, these units have a fixed number of trays. And, horizontal airflow models tend to be pricier. I expect to dehydrate peppers, tomatoes and herbs from my garden. But with one, a whole new world opens up. Crackers? Fruit? Squash? Would you recommend buying a round vertical or square horizontal airflow unit? If side airflow, I have to choose a size, generally 5- or 9-tray. What would you recommend for home use? With either choice, what brand do you recommend.